New Mexico has the oldest regional cuisine in the United States. Native Americans have inhabited the Southwest for roughly 1,500 years and Santa Fe, the state capital, was established more than four hundred years ago. Northern New Mexico’s history and food are inextricably intertwined because as power shifted and cultures merged, so too did the local food. Santa Fe was the terminus point for both El Camino Real (from Mexico City) and the Santa Fe Trail (from Missouri). The influences of the Native Americans, Spanish, Mexican, and Anglo settlers have shaped New Mexican cuisine. In Santa Fe, you can’t escape the two Cs: corn and chile. Corn was a vital part of the Native American diet and the crop – whether blue, white, or yellow – continues to be a key ingredient in local cooking. In New Mexican restaurants, posole (or hominy) is a ubiquitous side dish. Hominy corn is boiled in a mixture of water and lime to soften the kernels. The tough hulls rise to the surface and are removed, while the skinless corn kernels inflate, like solid popcorn. The term posole is used for both the processed corn kernel and the resulting dish. Posole becomes an entrée when chefs add pork and chile, turning it into a stew. Traditionally, this version of posole was served on Native American feast-days. You can also grind the processed kernels to create dough known as masa, which is used to make corn tortillas. Flour tortillas are also available, but New Mexican ones are thicker (and yummier) than their counterparts in California or Arizona. You can thank the Spanish for that, because they were the ones who first brought wheat to the area. They also imported chile peppers from Central America and given this influence, it makes sense that New Mexico retains the Spanish spelling of chili: chile. Prior to the arrival of the Spanish, Native Americans spiced their food with chiltepin chiles, which grow wild in the Southwest. These berries are only about a quarter inch in diameter, but they score 100,000 on the Scoville scale, the equivalent of a Thai chili pepper. Today, New Mexico is the state that produces and eats the most chiles. To ensure quality and to protect the industry, the New Mexico Chile Advertising Act ensures that only chiles grown within the state can be identified as New Mexico chile. Much of the crop is produced near Hatch in the south, but this is a geographic location rather than a variety of produce. There are several types of New Mexico Green Chile, which are distinguishable by their heat levels. Red chiles are simply green ones that are harvested later, after the color has changed. While neighboring southwestern states treat chile as a spice, in New Mexico it is considered a food – and a healthy one at that. Fresh green chile has twice as much vitamin C as citrus fruit. In Santa Fe, numerous dishes are slathered with chile sauce – it’s New Mexico’s brand of ketchup. In fact, the official state question “red or green?” is asked to determine which kind of chile sauce you’d like over your food. Answering “Christmas” means you want both. In my experience, red tends to be hotter, but factors such as time of harvest, variety of chile, and growing methods affect the kick. 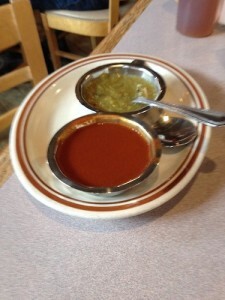 Green chile sauce is essentially pureed green chiles with stock and spices. Red chile sauce can follow a similar recipe but sometimes it’s made from dried rather than fresh red chiles. 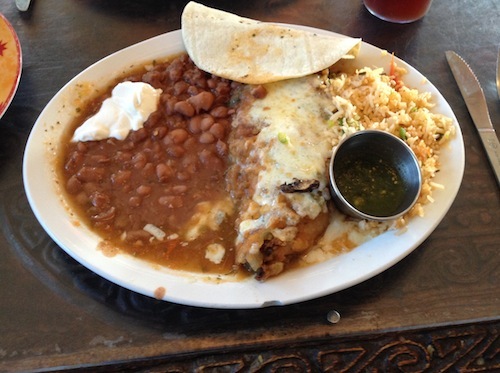 Enchiladas – Virtually every New Mexican style restaurant offers cheese, chicken or beef enchiladas. It’s as prevalent as burger and fries. Traditionally, the yellow or blue corn tortillas are served open face and stacked, not rolled. You may also see this dish listed as an enchilada casserole. Some restaurants encourage you to add a fried egg on the side or on top, to reduce the burn from the chile. 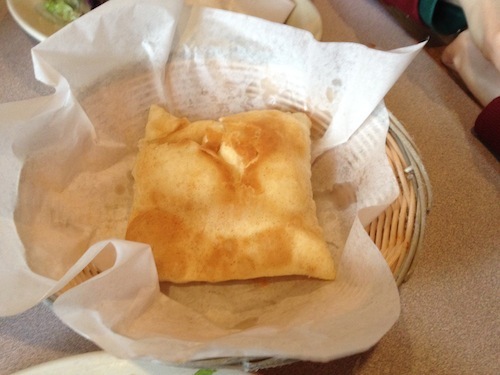 Sopaipillas – These deep-fried pieces of dough originated in New Mexico. Some claim they are simply smaller versions of fry-bread and, to be sure, sopaipillas are divine when drizzled with honey. If you’re monitoring carbs, don’t take a single bite, because after this flaky cloud of honey hits your tongue, you’re a goner. Served as dessert or in place of bread, sopaipillas with honey offset the spice of chile. Savory versions are stuffed with chicken, beef or beans and covered with melted cheese and chile sauce. Chile rellenos – Although it originates from south of the border, this dish can be found on many New Mexican menus. The classic version involves poblano or New Mexican green chiles stuffed with cheese before being battered and immersed in a deep-fat fryer. Carne adovada – This dish can have as much kick as an irate mule. Red chile, onion, and spices are pureed into a marinade. The pork takes a lengthy siesta in this mixture, usually for a day or more. Then the meat is baked and the marinade cooked off, leaving dry, very spicy pork. In Santa Fe, carne adovada appears on tortillas and in tamales and burritos. Where to find it: La Choza, where the pork is extremely moist. Breakfast burrito – A Santa Fe café claims to have invented the breakfast burrito during the 1970s. In New Mexican cuisine, potatoes are overshadowed by rice for the glue that holds a breakfast burrito together. Other possible ingredients include scrambled eggs, bacon, chorizo, carne adovada, cheese, pinto beans and, of course, chile. Where to find it: The Pantry, where you can customize the breakfast burritos. Green chile stew – Roasted and peeled green chiles are combined with meat (usually pork or beef) and potatoes. Restaurants individualize this dish with added ingredients such as beans, corn, or onions. 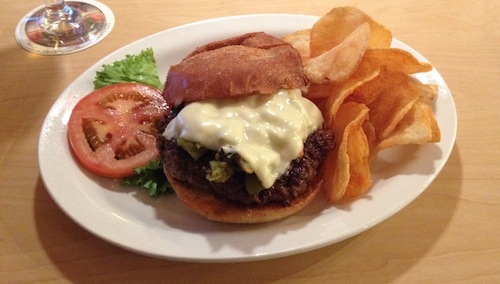 Green chile cheeseburger – New Mexicans believe that failing to apply liberal doses of green chile to any remotely viable food is a grave oversight. It’s even a frequent topping on pizzas, so it’s no surprise that cheeseburgers received a chile makeover. Most joints provide the heat via a green chile sauce, although a few places deliver your burger topped with sliced and grilled chile instead. Frito Pie – This snack features the other kind of chili and is often served in a slit-open Frito bag. Beef chili with beans and a blend of Mexican cheeses cover the chips. Where to find it: The snack bar inside the Five and Dime, where Frito Pie was invented. 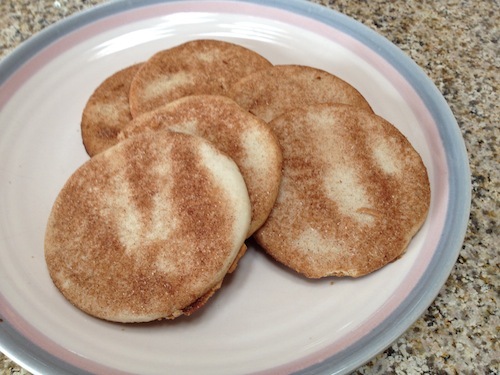 Biscochito – New Mexico was the first state to pass a law naming an official state cookie – biscochitos. But that doesn’t mean there is a universally accepted recipe. I’ve sampled cookies similar to shortbread and others with pastry-like layers. Anise or anise seed give the bischochito its unique flavor, and most are dusted with cinnamon. Diehard fans insist that they should be made with lard to guarantee the best taste and texture. Where to find it: El Parasol, where they are literally made by grandma. Biscochitos are associated with Christmas and are easiest to find around the holidays. Juliet White co-writes Southwest Compass, a travel blog devoted to the American Southwest, which has a section specifically for food lovers. She is based in Santa Fe, New Mexico.